Are you looking forward to spend your dream holiday in an exceptional Villa situated in a splendid and natural environment with two magnificent sand beaches just next to you! Look no more because you’ve just found yourself one ! PLAYA COLORADO and PLAYA RINCON are the most beautiful beaches in the Dominican Republic. One is in front of you and the other one is just next. Both of them awaits you. Enjoy the shade under the palms and swim in a blue sea that shades into green. Our villa is situated in a place of total security and in a very beautiful tropical park. Enjoy the comfort of each bedroom with its private bathroom and toilet, its large balcony with nice ocean view. The living-room and the dining-room in the covered exterior terraces with the tropical wooden deck around the swimming pool (9m X 6m) allows you to live inside or outside as you like it. An American kitchen is well designed to bring all the happiness you hope. ACCESS TO THE VILLA : By plane: International airports ;Santo Domingo las Americas (SDQ). Samana El Catey (AZS), Puerto Plata, Santiago, Aerodrome :El portillo(Las terrenas).By car: Samana and Las Galeras direction. Before Las Galeras (about 15km from Samana), take Playa Rincon Road to your left. From Los Tocones village, take right to Colorado Bay road (road sign), At the end, a paradise that you merit, awaits you! ( Better if you rent a SUV!!!). PROVIDED SERVICES: Bedding and washing, house personal attendant included, possibility of babysitting services, gardener /caretaker, nice and welcoming reception, handicapped access, transport to the Airport on demand. Directly on the semi private beach Playa Colorado closed to Playa Rincon Exclusive situation in one of the most beautiful bay in the world !!!! EQUIPMENT Bedding : 4 double beds (2 king size and 2 queen size ), bed sheets and towels provided, private swimming-pool, telephone, electric and gas cooker with four heating surfaces, a refrigerator with freezing compartment, a deep freezer, coffee maker, toaster, barbecue, books, living-room looking out on tropical garden, swimming-pool beds, safe, ventilators, hi-fi. PROVIDED SERVICES Bedding and washing, house personal attendant included, possibility of babysitting services, gardener /caretaker, nice and welcoming reception, handicapped access, transport to the Airport on demand. Thank you Evelyn for your helpful comments. What a good idea to prepare a list of special available.menus for our guests! Yes, it is better to rent a car when you book our villa.. So it is easy to visit the best places of Samana Peninsula, organize your own shopping, and go to famous restaurants around Las Galeras. Yes we are in a tropical area , so we have every sort of animals but included too; beautiful birds (caracoleros, Hummingbirds, fregates, etc..) splendid tropical flowers and tipical fishing or country people scenaries. Yes it is an adventure,.... the best one! There were 8 people in our party and we all had a very good experience. The house was a good size for are family. We especially appreciated Carla and Diogenes. They were so helpful and kind. We never felt they were an intrusion. The night guard, Noel made us feel very safe as well as Jeffery who accompanied us on our hike and ATV adventure. The pool was really nice. Carla cooked for us every night but one plus made delicious corn cakes, fried bananas, and delicious pina coladas and passion juice. The beach was close and beautiful. Our teenage children loved riding the waves. We played lots of games together and it was wonderful to not have TV or internet access. A lot of bonding time and relaxing time for are family who live busy lives in the states. Our only negative is the long ride from the airport. It was also nice being so secluded from a lot of tourist and very little chance to shop. We chose not to rent a car which limited our activities, but that also gave us the opportunity to truly relax and grow closer. A wonderful trip!! What a wonderful holiday! The house, while a little off the beaten path, was beautiful. Extremely well kept and a true villa. Three large bedrooms upstairs, each with its own bathroom, plus another en-suite bedroom on the first floor allowed all of our guests privacy, and convenience for our older guest who has trouble with stairs. Most exciting was the private beach just steps from the house. We listened to the waves crashing at night and woke to views of the water and hills. The house staff couldn’t have been more helpful. We got in very late in the evening and Diogenes was waiting to guide us to the house. We also arranged for dinner to be prepared for most of our stay - it was well worth it! Two recommendations: Definitely rent an SUV - most the roads around the house are dirt and rocky so you’ll need it! And don’t forget your bug spray. The windows do not have screens, which we didn’t mind, but you’ll wake up to chewed legs if you don’t spray before bed! Thank you, Vincent, for making this marvelous house available to vacationers. It was truly a paradise. This is quite simply the most beautiful place imaginable. 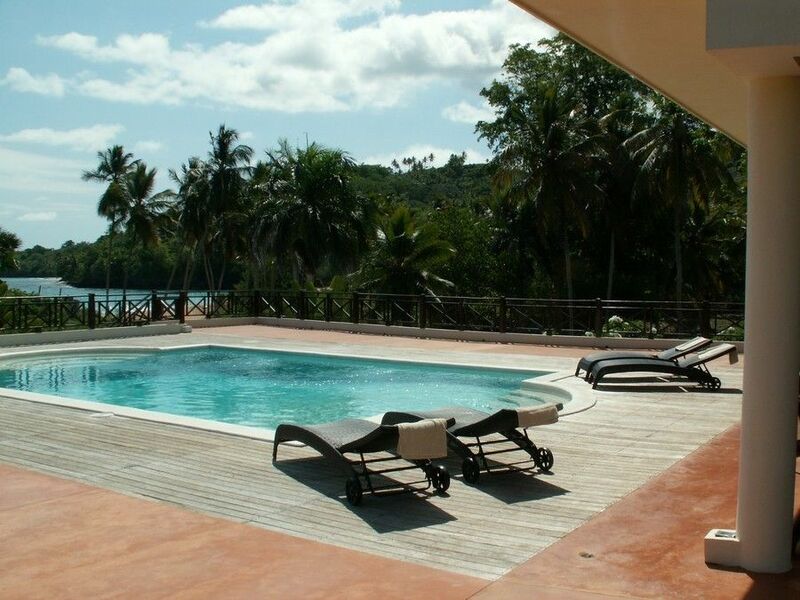 The villa is set in a very private location next to two stunning semi private beaches. We rarely saw another person on either beach. The villa is spacious, well kept with stunning views. It is very well equiped and keeps cool even in summer so we didnt need the airconditioning.The staff, Diogenes, Dulis and Noen were friendly and extremely helpful but unobtrusive. The pool is large. deep, warm and well kept..We had no problem with mosquitos or other unwelcome insects. Although off the beaten track the road is not too bad, an SUV is helpful but a 4x4 not essential. It is still easy to go out for dinner and to visit the rest of the penisula with its many beautiful beaches.towns and waterfalls. The Dominicans are extremely friendly warm people who made us feel very welcome.We were humbled by their generosity..
We have travelled extensively and will definitely return to this peaceful haven. We hope you can come back to our little paradise. We are so happy and work hard to make better and better our service. All was paradisiac: staff, villa, beach, swimming pool, etc..
Really lovely house, right on the beach, secluded location, 3 other houses on the property, the gardens all around the house are well maintained, the pool and pool area are also well maintained - pool chlorine level was low - I prefer a saline pool so was wary of a chlorine pool and had no problem swimming in this pool , each bedroom with it's own bath, nice living room area and great kitchen. At night the sound of the surf is right there, the rain on the roof - if it rains - is magical. If you are looking for a totally secluded get away to write a book, decompress, reconnect with the missed sleep/a book you want to read/sun/sand/surf, this was a lovely getaway for us. The water is a lovely blue/light green and bathtub warm. The body surfing was great. If you plan to come here staying at the pool on the property is the best way to go; there are not beach chairs if you want to stay at the beach all day. If you want to go away from the house and go to a restaurant or coffee shop this is not that place, but you can rent boats and guides to take you to these places. We opted to have a chef prepare local cuisine, and it is well worth it, while we were there the locals who fish from the beach area/surrounding waters showed us a lobster and inquired if we wanted to purchase it, not being spanish speakers I said "Pasquala" our chef's name, and the following evening that lobster was on the BBQ for us. The internet is intermittent, so be prepared to not stress over it. Spanish, so we did spend sometime with Google translate. The ideal situation during the day allows one to visit the most remarkable sites of the Peninsula (Playa Rincon, Los Haitises national park, whale excursion trips, el Limon water falls, Las Terrenas and its beaches ,…etc).